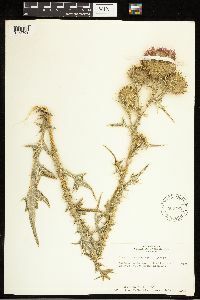 Biennials, 30-200(-300) cm; taproots. Stems 1-many, erect or ascending, branches few-many, ascending, villous with septate trichomes. 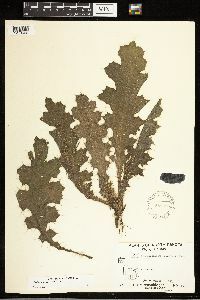 Leaves: blades oblong-lanceolate to obovate, 15-40 × 6-15 cm, margins plane or revolute, coarsely 1-2-pinnatifid with rigidly divergent lobes, sometimes merely spinose-dentate, lobes triangular to lanceolate, entire to spiny-dentate, main spines 2-10 mm, abaxial faces gray-tomentose, villous with septate trichomes along veins, adaxial green, covered with short appressed bristlelike spines, sometimes tomentose when young; basal present or absent at flowering, petioles winged, bases tapered; principal cauline winged-petiolate, mid and distal becoming sessile, well distributed or not, progressively reduced distally, at least distal decurrent as long spiny wings; distal cauline often more deeply lobed than proximal, main lobes rigidly spiny, margins spinulose, otherwise entire. Heads few-many in corymbiform or paniculiform arrays. 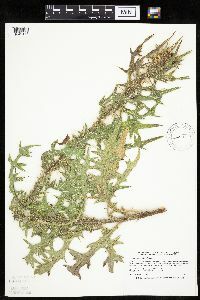 Peduncles 1-6 cm. 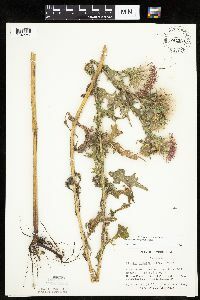 Involucres hemispheric to campanulate, 3-4 × 2-4 cm, loosely arachnoid-tomentose. Phyllaries in 10-12 series, strongly imbricate, linear-lanceolate (outer) to linear (inner), outer and middle appressed, (bases stramineous), margins entire, abaxial faces without glutinous ridge, apices radiating, greenish, spines 2-5 mm; apices of inner phyllaries flat, serrulate to minutely erose. Corollas purple (rarely white), 25-35 mm, tubes 18-25 mm, throats 5-6 mm, lobes 5-7 mm; style tips 3.5-6 mm. Cypselae light brown with darker streaks, 3-4.5 mm, apical collar not differentiated; pappi 20-30 mm. 2n = 68. Flowering mostly summer (Jun-Sep), year round in areas with mild climates. 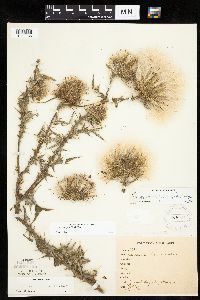 Invasive weed of disturbed sites, pastures, meadows, forest openings, roadsides; 0-2200 m; introduced; St. Pierre and Miquelon; Alta., B.C., Man., N.B., Nfld. and Labr. (Nfld. 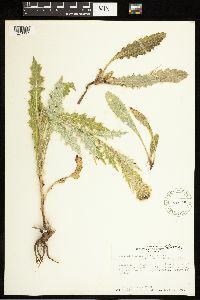 ), N.S., Ont., P.E.I., Que., Sask. ; Ala., Alaska, Ariz., Ark., Calif., Colo., Conn., Del., D.C., Fla., Ga., Idaho, Ill., Ind., Iowa, Kans., Ky., La., Maine, Md., Mass., Mich., Minn., Miss., Mo., Mont., Nebr., Nev., N.H., N.J., N.Mex., N.Y., N.C., N.Dak., Ohio, Okla., Oreg., Pa., R.I., S.C., S.Dak., Tenn., Tex., Utah, Vt., Va., Wash., W.Va., Wis., Wyo. ; Eurasia. This species is biennial. It no doubt has become established in every county of the state. It formerly was common in pastures and clearings, and frequent along roadsides and in fields, open woodland, and waste places. As nearly as I can remember, about 25 years ago it began to disappear, and in a few years it had practically disappeared. Its disappearance was due to the butterflies Vanessa cardui and Pyrameis cardui whose eggs are laid in the flowering heads, the larvae eating the seed. 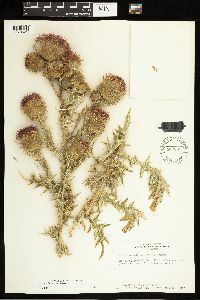 This thistle is now infrequent to rare in the state and I believe will be held in check by its natural enemy. 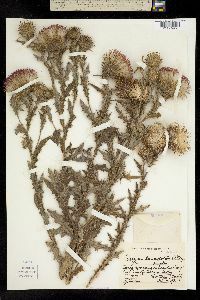 In 1938 I have noted more specimens than for many years.